Republican David Shafer (R) held this seat for three terms. He ran unopposed in both general and primary elections in 2012, 2014 and 2016. He served as Senate president pro tem, the second highest ranking leadership position in the Senate. His seat becomes vacant in 2018 as Shafer launches candidacy for Lt. Governor. Zahra S. Karinshak is the Democratic candidate. Karinshak is a partner at a law firm focusing her practice on white collar crime and whistleblower suits, and complex civil litigation. She was born in Tennessee but grew up in LaFayette, Georgia. In 1985, she entered the Air Force Academy. Karinshak received a B.S. in International Affairs, with a minor in Arabic, and was recognized as the Top Graduate in Law. She was commissioned as an officer in the U.S. Air Force and became an intelligence officer. During her military service, Karinshak received numerous awards, including the Meritorious Service Medal and the Air Force Commendation Medal. She supported Operation Desert Storm. After leaving the military to become a lawyer, she became the deputy executive counsel to Georgia Gov. Roy E. Barnes, later serving as an assistant U.S. attorney for the Northern District of Georgia. Karinshak's father emigrated from Iran while her mother is a native of LaFayette, Georgia. Two of her four siblings have served in the military, including combat tours in Iraq and Afghanistan. She is married to Bruce M. Karinshak, a vice president at The Coca-Cola Co., who is a West Point graduate and formerly served in the U.S. Army as a combat engineer (Airborne Ranger qualified). 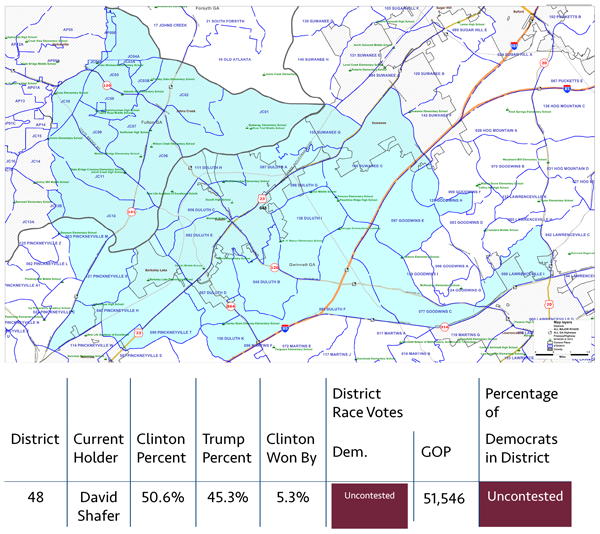 Hillary Clinton won this district by 5.3 percent.